My last blogpost was about the 3 week Street Photography challenge I had with the medium format GFX 50R end of last year. If you missed it, please check it out here. When I wrote the post, I did leave one image out on purpose as I had it in mind for my next Pic(k) of the week. Although I'm not the one that came up with this first, I often talk about 3 ways to shoot the street, all starting with a F; the first one is Fishing, where the photographer waits at a certain spot for a subject to walk into the frame. Then we have Follow, where one just shadows a subject before making the image. The last one, sounds like "duck" but starts with an F; this is when all of a sudden we see a scene develop and only have a split second to frame the image. Back to the image which I for obvious reasons, called "Five guys". 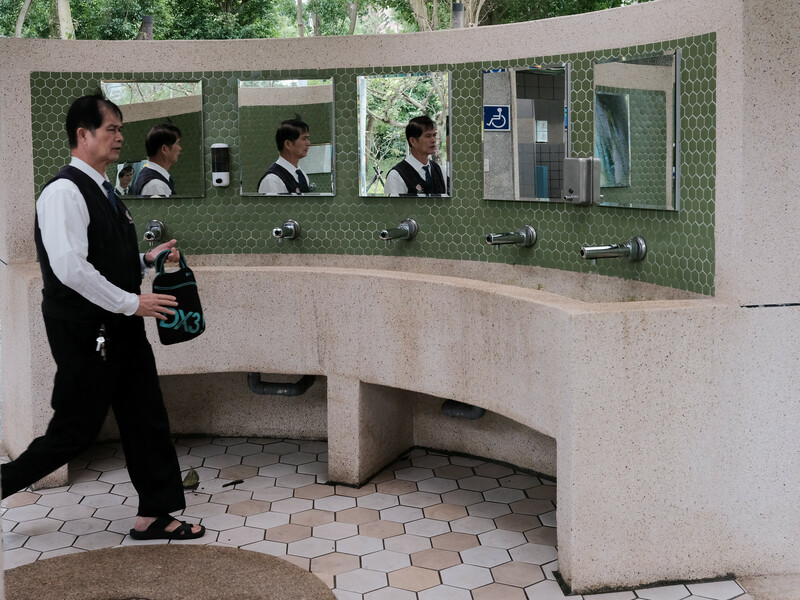 When I used a public toilet in a small park in Taipei (Taiwan), I knew there was an image to be made. SOOC (Straight out of camera) jpeg file using Classic Chrome Film simulation. More of my Street Photography from Taipei, can be found here. Remember: "Life is only a reflection of what we allow ourselves to see" .